Getting Chromium to show up inside a .NET WinForms application is relatively easy using CefSharp. 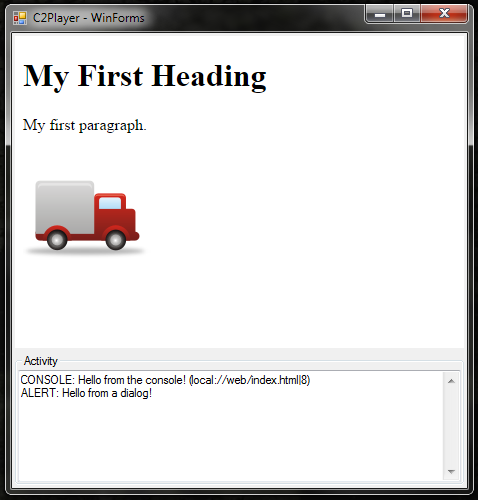 CefSharp is an open source project which provides Embedded Chromium for .NET (WPF & WinForms). It’s a great way to get Chrome hosted inside of your .NET application. You can get a simple browser up and running in 5 minutes – which I’ll show you first. There are some additional steps required to use local resources and to handle console messages and dialog prompts which I’ll also show you. There’s an easy example over on the CefSharp project page called the MinimalExample that will get you up and running quickly with a bunch of the basics. I’m going to walk you through some very quick steps to just get an embedded browser working in a WinForm. 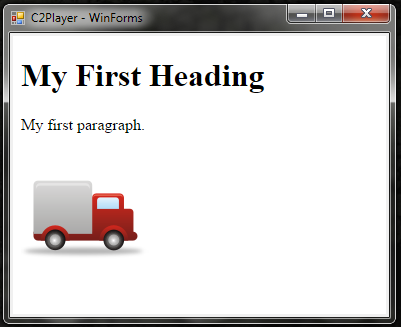 First, create a new WinForms project. I’m using VB.NET (but C# works great too, of course) and am targeting .NET 4.5. Once you’ve got a project, you’ll need to add the CefSharp binaries. This is done through NuGet and is really simple. This will take just a few seconds while it also adds all of the dependent packages. In the end you’ll have 4 packages (CefSharp.WinForms, CefSharp.Common, cef.redist.x64 and cef.redist.x86). Go ahead and build the project to make sure there are no reference errors. Open your form and slap a Panel control on there (I’ve named mine panBrowser and set it’s Dock property to Fill). This isn’t required, but it certainly makes it easier to move around when changing your form later. Congratulations, you’ve got Chrome in your Form! You might have noticed a <script> tag in our index.html above with a call to the console. CefSharp provides us with an easy event, ConsoleMessage, that allows us to grab those messages and do whatever we want with them. In our case we just want to display those messages in a TextBox. We’ve added a handler for the ConsoleMessage event (lines 25-31). The ConsoleMessageEventArgs object provides us with three useful properties: Message, Source and Line. We always receive the Message and depending on how the call to the console was made we may receive information about the Source. When the Line is greater than 0 we output the Message and the Source/Line information, otherwise it’s just the Message. In our application we’d like to redirect these to our Activity feed as well. In CefSharp, you override the default handling of dialogs (alerts, confirmations and prompts) by implementing an IJsDialogHandler object. The IJsDialogHandler interface requires us to implement the OnJSAlert, OnJSConfirm and OnJSPrompt functions. We’ve also added a construtor that takes an Action(Of String) which we will use to handle our logging. We store this Action into our private logReceiver object (line 8) so that we can use it later. Then in our implementation of the functions we just call logReceiver with an informative message regarding what’s occurred. In each case we return True to indicate that the alert, etc. has been handled. Obviously, there is a lot you can do with this and there are many features we haven’t even begun to demonstrate, but this should get you started. For me the goal has been to get a Construct 2 game running in a .NET application. In my next post I’ll show you exactly that. Thank you for this tutorial, I found it to be extremely helpful. Would you be able to go over how to handle keyboard input, and how pass that input to the form? I know I can implement IKeyboardHandler, but I have no idea what that looks like. I haven’t had a need to implement IKeyboardHandler yet. I’ve had no trouble getting keystrokes and mouse input sent directly to the ChromiumWebBrowser. As long as it is the focus, everything just gets passed through. Please let me know if this isn’t working for you. Thanks for your feedback! Hello, where I can find source code? CefSettings could not be found ?? Do you have both of the Imports (Using in C#) statements in the same code file where you are attempting to use CefSettings? This is what I looking for to replace IE. 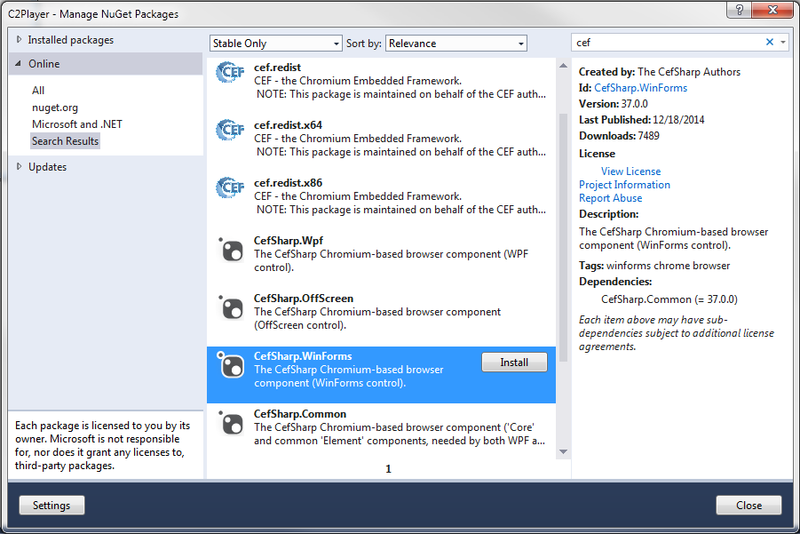 Did you use NuGet to get the CefSharp.WinForms package? This package will automatically add references to CefSharp, CefSharp.Core, and CefSharp.WinForms. If you are manually adding these references, you’ll want to make sure you’ve added all 3. Yes I installed all three through NuGet and checked them in Project references. So unfortunately, that makes the code posted above inaccurate with the latest versions. how can I disable the drag & drop function in my browser ? how can I disable the right click menu ? how can I set the zoom level of browser ? Hello! Great Work!! now i only have a slight problem, how do i make it to save a file.. i opened a certain html page in the vb app with the chromium, now i wanted to save a file from the html page..
How can I enable address bar? ‘Browser1.exe’ (CLR v4.0.30319: DefaultDomain) : Chargé ‘C:\WINDOWS\Microsoft.Net\assembly\GAC_64\mscorlib\v4.0_4.0.0.0__b77a5c561934e089\mscorlib.dll’. Impossible de trouver ou d’ouvrir le fichier PDB. ‘Browser1.exe’ (CLR v4.0.30319: DefaultDomain) : Chargé ‘C:\Users\ROBBO\Documents\Visual Studio 2017\Projects\Browser1\Browser1\bin\x64\Debug\Browser1.exe’. Les symboles ont été chargés. ‘Browser1.exe’ (CLR v4.0.30319: Browser1.exe) : Chargé ‘C:\WINDOWS\Microsoft.Net\assembly\GAC_MSIL\Microsoft.VisualBasic\v4.0_10.0.0.0__b03f5f7f11d50a3a\Microsoft.VisualBasic.dll’. Impossible de trouver ou d’ouvrir le fichier PDB. ‘Browser1.exe’ (CLR v4.0.30319: Browser1.exe) : Chargé ‘C:\WINDOWS\Microsoft.Net\assembly\GAC_MSIL\System\v4.0_4.0.0.0__b77a5c561934e089\System.dll’. Impossible de trouver ou d’ouvrir le fichier PDB. ‘Browser1.exe’ (CLR v4.0.30319: Browser1.exe) : Chargé ‘C:\WINDOWS\Microsoft.Net\assembly\GAC_MSIL\System.Core\v4.0_4.0.0.0__b77a5c561934e089\System.Core.dll’. Impossible de trouver ou d’ouvrir le fichier PDB. ‘Browser1.exe’ (CLR v4.0.30319: Browser1.exe) : Chargé ‘C:\WINDOWS\Microsoft.Net\assembly\GAC_MSIL\System.Windows.Forms\v4.0_4.0.0.0__b77a5c561934e089\System.Windows.Forms.dll’. Impossible de trouver ou d’ouvrir le fichier PDB. ‘Browser1.exe’ (CLR v4.0.30319: Browser1.exe) : Chargé ‘C:\WINDOWS\Microsoft.Net\assembly\GAC_MSIL\System.Drawing\v4.0_4.0.0.0__b03f5f7f11d50a3a\System.Drawing.dll’. Impossible de trouver ou d’ouvrir le fichier PDB. ‘Browser1.exe’ (CLR v4.0.30319: Browser1.exe) : Chargé ‘C:\WINDOWS\Microsoft.Net\assembly\GAC_MSIL\System.Configuration\v4.0_4.0.0.0__b03f5f7f11d50a3a\System.Configuration.dll’. Impossible de trouver ou d’ouvrir le fichier PDB. ‘Browser1.exe’ (CLR v4.0.30319: Browser1.exe) : Chargé ‘C:\WINDOWS\Microsoft.Net\assembly\GAC_MSIL\System.Xml\v4.0_4.0.0.0__b77a5c561934e089\System.Xml.dll’. Impossible de trouver ou d’ouvrir le fichier PDB. ‘Browser1.exe’ (CLR v4.0.30319: Browser1.exe) : Chargé ‘C:\WINDOWS\Microsoft.Net\assembly\GAC_MSIL\System.Runtime.Remoting\v4.0_4.0.0.0__b77a5c561934e089\System.Runtime.Remoting.dll’. Impossible de trouver ou d’ouvrir le fichier PDB. ‘Browser1.exe’ (CLR v4.0.30319: Browser1.exe) : Chargé ‘C:\Users\ROBBO\Documents\Visual Studio 2017\Projects\Browser1\Browser1\bin\x64\Debug\CefSharp.Core.dll’. Impossible de trouver ou d’ouvrir le fichier PDB. ‘Browser1.exe’ (CLR v4.0.30319: Browser1.exe) : Chargé ‘C:\Users\ROBBO\Documents\Visual Studio 2017\Projects\Browser1\Browser1\bin\x64\Debug\CefSharp.WinForms.dll’. Impossible de trouver ou d’ouvrir le fichier PDB. ‘Browser1.exe’ (CLR v4.0.30319: Browser1.exe) : Chargé ‘C:\Users\ROBBO\Documents\Visual Studio 2017\Projects\Browser1\Browser1\bin\x64\Debug\CefSharp.dll’. Impossible de trouver ou d’ouvrir le fichier PDB. Le programme ‘ Browser1.exe’ s’est arrêté avec le code -1073741819 (0xc0000005) ‘Access violation’. This doesn’t look promising to me! I am using a French version of VS 2017. Do you have any ideas please?